Here's what you will find in Hackercool November 2016 Issue . 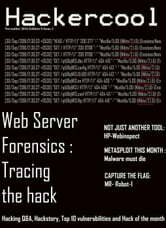 Real Time Hacking Scenario : Web Server Forensics Every hacker leaves his trails, let's find out how to trace his steps back. Installit : Vmware has recommended using OpenVM tools instead of Vmware tools. See how to install them in Kali Linux. Hackstory : Learn about a different cyber war going on between the super powers. Hack of the month : Red Cross Australia is the hack of the month. Data breaches don't always need bad guys. 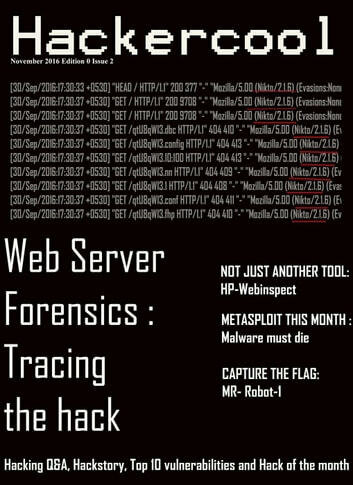 Metasploit this month : Let In this issue, we will use Metasploit to target malware and hack a system. Hack of the month : Everything you need to know about the Yahoo hack and what could you do. Capture The Flags : Capture the Flag challenges present an opportunity to learn real time hacking. So we included it starting with Mr. Robot CTF. 11.Top 10 Vulnerabilities of the Month : Answers to some of the question's on hacking asked by our readers.